Hey! 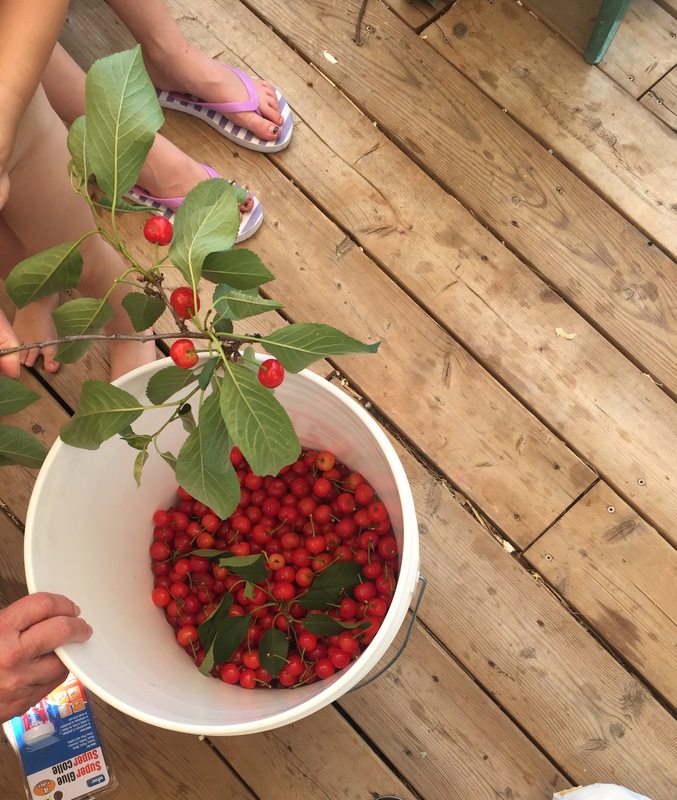 I was lucky enough to find a sour cherry tree in my neighbourhood. So I took the kids and we loaded up. We got a good amount in a short amount of time. The trees are almost always full of fruit because people try one, thinking they’re regular cherries and don’t like them due to the sourness. I had enough to make jam so I tried a new recipe. 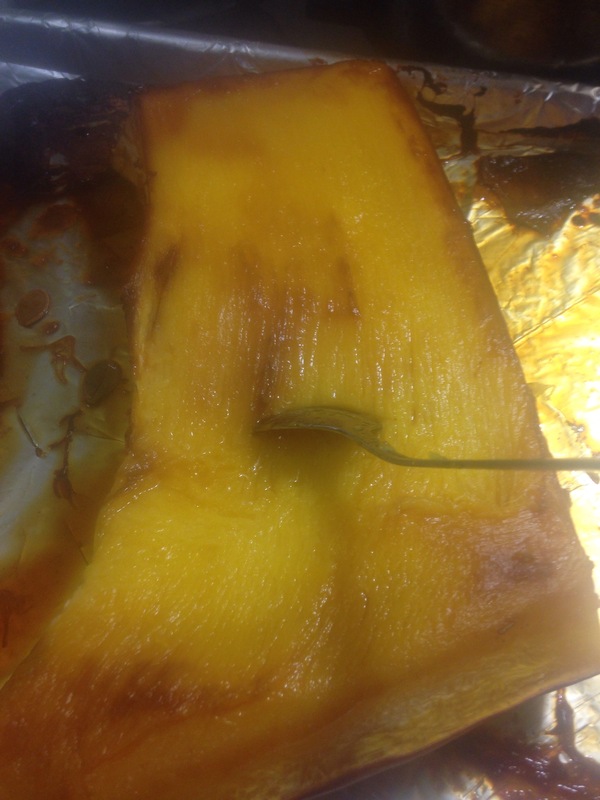 It didn’t set for me but next time I’ll either add pectin or boil longer. It’s still delicious and is being used in drinks and on ice cream. I took 12 cups of pitted sour cherries and 5 cups of white sugar. Bring to a boil and left it boiling heavily for about an hour while my jars (8 250ml jars) were in a hot water bath. At this point I’d recommend testing for viscosity by taking out a bit and doing the wrinkle test. I was impatient I guess and just canned it at that point. I left 1″ headspace in my jars and then boiled the jars for 10 minutes. They then sat on the counter for 24 hours while they sealed and cooled. 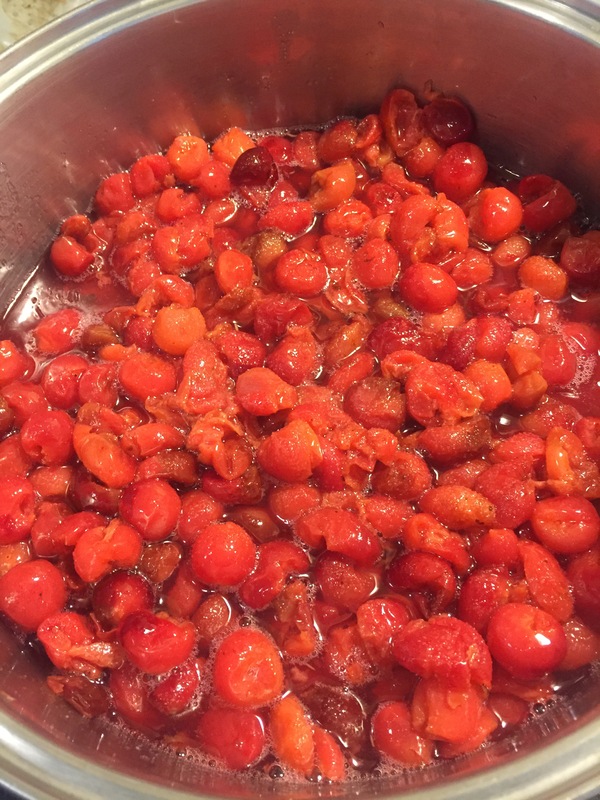 If you didn’t want to go this route, sour cherries are also good dehydrated with a bit of sugar, or frozen and added to baked goods. Let me start off by saying I meant to blog this last week but I ended up with a sick kid and TWO emergency visits to the vet with my dog (that was an unexpected nearly $1000 bill!) and I’ve been making as much products for my business as I can to make up for the expense. Anyways, garlic mustard grows nearly everywhere. 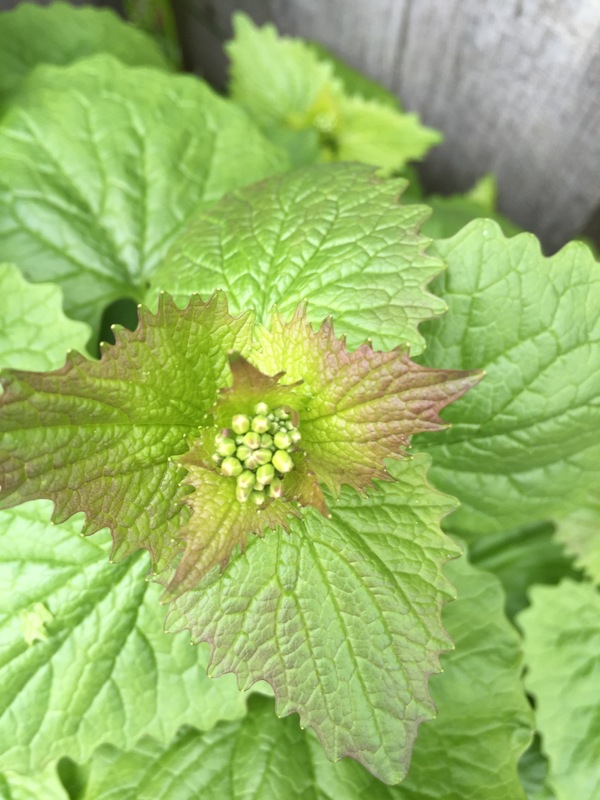 It’s one of the first plants to come up in spring and most people think it’s just a weed. It’s all over my yard right now and the park we go to is full of it, it’s very easy to get lots of it. The smell is obviously oniony/garlicky. I’ve seen people add it to salads but I personally like to make it into a pesto with lemon juice or just purée it. Then I put it in ice cube trays and freeze it, adding it to dishes as I need. There’s a close up of the leaves and flowers, when the flowers open they are small and white. 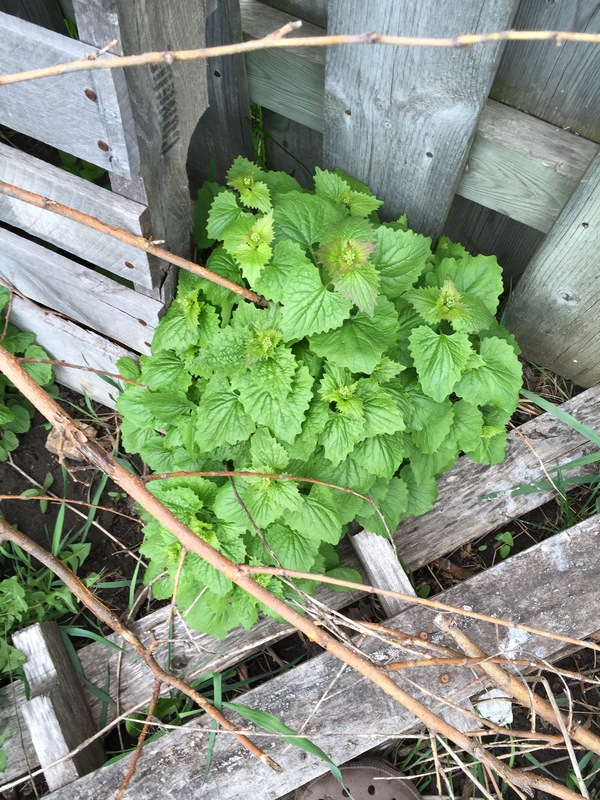 There’s lots of information around the web on garlic mustard so make sure you research before you forage! Good luck finding it and I hope you like it! 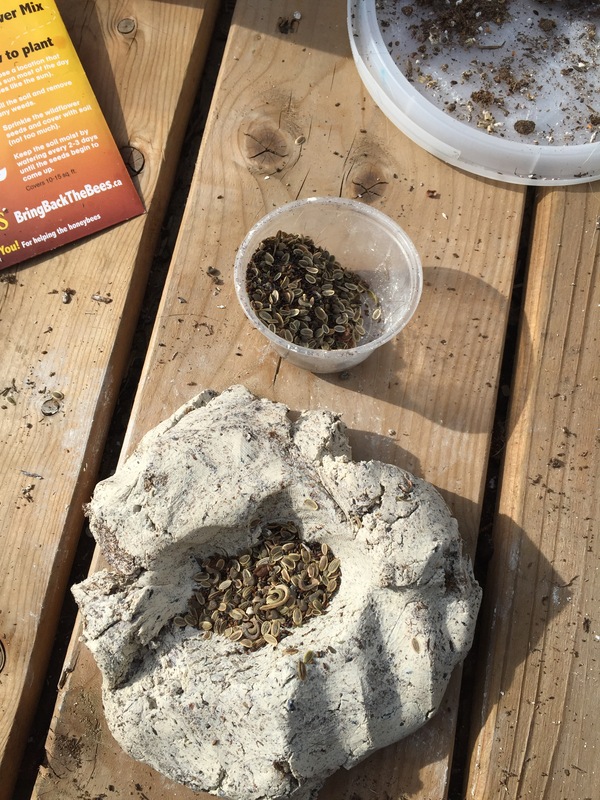 Here’s a fun little project you can do with your little preppers! Seed bombs are little balls made of seeds and growing medium. The ones we made were clay, soil and seeds. 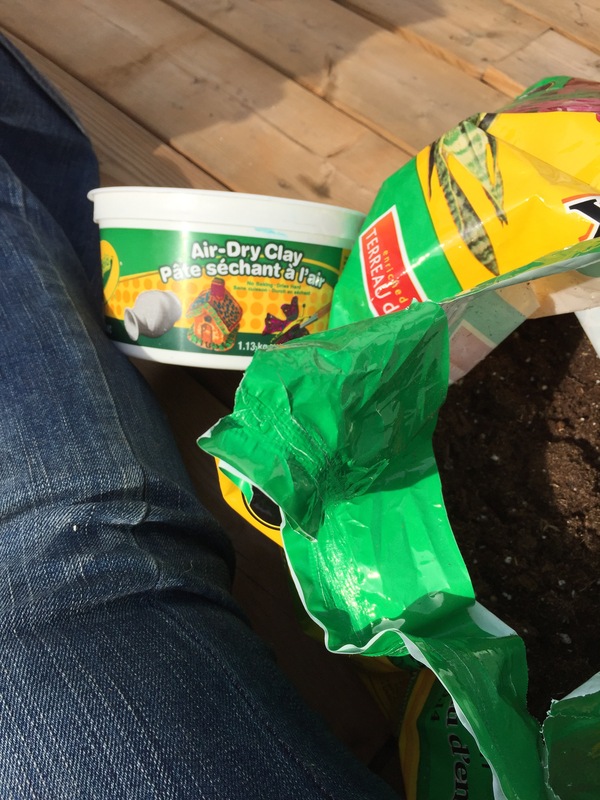 Mix your clay so that its pliable, add in your soil and then add in your seeds. 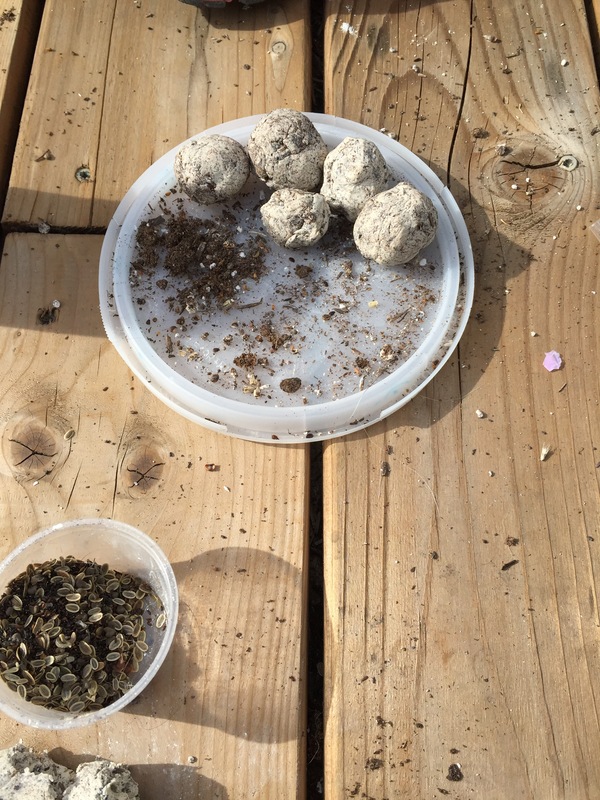 We made two types of seed bombs: one with local edible and medicinal herbs and the other with wild flowers. Let them dry 24 hours and then spread them around! A great way to beautify (or make useable and an additional prep!) an empty space! Here’s the ones the kids did! Love the idea, don’t have the time? These things seem to be popular on etsy and you can find them there (including my shop soon!). Get out there and guerilla garden! Tis the season of the pumpkin! A couple days after Halloween, a friend of mine asked me if I wanted some pumpkins left over from landscaping. They were large and hadn’t been carved so I said sure! I hate to see them go to waste. This picture is the smallest of the three I received. Two I opened up, gutted and saved the seeds then cut up and roasted the flesh for puree (more in a sec). The third made for great machete practise! 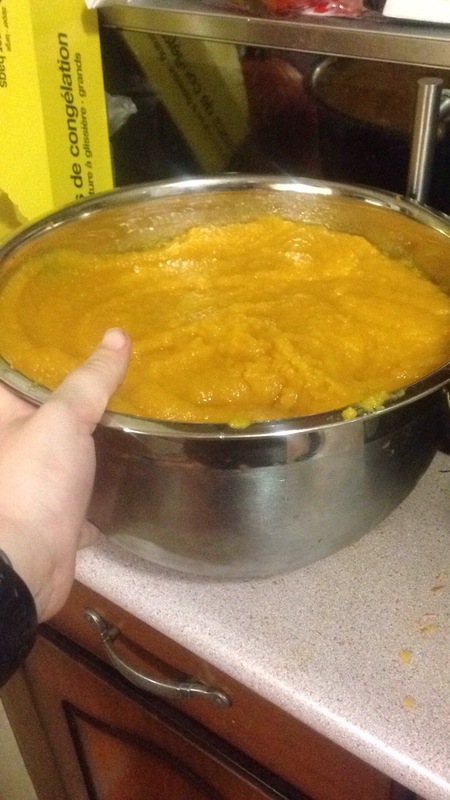 To make the pumpkin purée, I cut the flesh (after scraping etc) into manageable sized chunks and put them on a cookie sheet with skins up. I baked them at 350f for about 2 hours (they had super thick flesh,start at 45 minutes, it’s ready when a knife passes easily through). Let them cool a bit then scrape all the good stuff off the skins with a spoon and let cool further. The skins then went into my compost. The roasted flesh then went through my blender (but you could easily use a food processor or food mill) then into freezer bags. If you’re freezing it, get as much air out as possible and freeze flat. You can also dehydrate the pumpkin purée, if you don’t have the fruit leather tray covers, use parchment paper to line your trays. Half the seeds I roasted for a snack for my family and the other half will be planted come spring. Pumpkins are cheap and plentiful this time of year, with many grocery stores putting them on clearance after Halloween or thanksgiving. Don’t pass up your chance for a whole lot of food for little money! 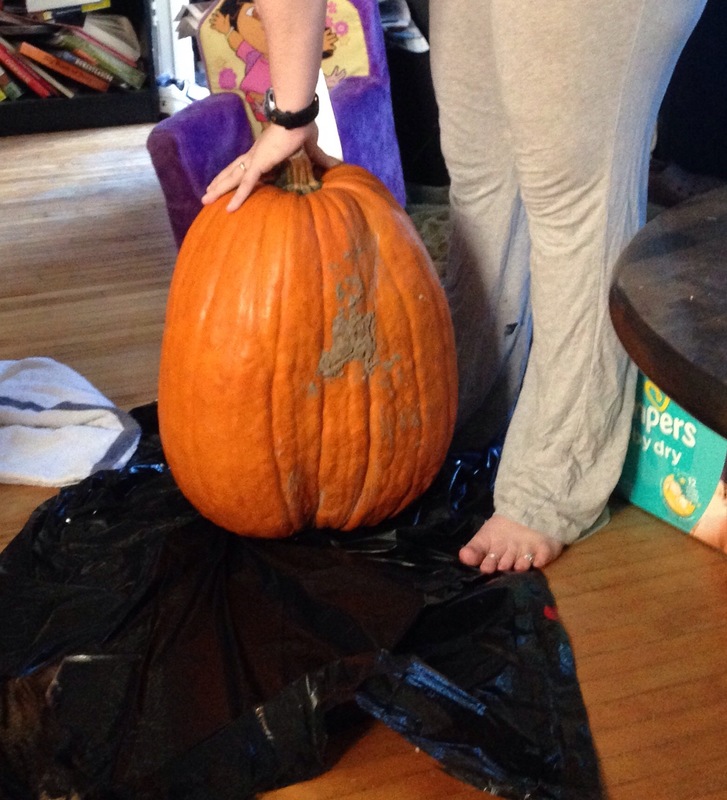 About 3/4 of the above pictured pumpkin. As you know, I’ve been absent for a while and I’d like to share with you a bit of what happened and how it would play out in an emergency scenario. In January 2014, after having tried unsuccessfully for 2+ years and being told it was impossible, I became pregnant. Almost right away there were issues. I started bleeding heavily and was told I had miscarried. We ran some blood tests and my hormone levels weren’t going down so the doctor scheduled an emergency ultrasound to be followed by a dilation and cutterage (d&c) to remove the failed pregnancy. The tech at the ultrasound place asked if we were dating the pregnancy and sadly I replied that no, we were confirming my miscarriage. To our surprise, the baby was still there, heart beating and jumping around. The problem was not the baby, it was a huge sac of blood between my uterus and the placenta. This is called a subchorionic hemorrhage and can be very dangerous, so I was sent to the top high risk obstetrician in the city. The blood, it turns out, could do a few things; it could grow and disconnect the placenta thus ending the pregnancy. It could stay as is and not allow the baby room to grow. It could bleed out or it could re absorb. In any case, I wasn’t allowed to lift more than 5-10lbs, raise my heart beat or sweat or do anything strenuous. I continued to bleed until I was 17 weeks pregnant. At my 13 week tri-scan, I screened positive for neural tube issues. The baby could be missing its head and/or part of the brain, could have an open spinal cord such as spina bifida or could end up having Down syndrome. The doctors encouraged me to think of my options because there was the chance of miscarriage, stillborn or no quality of life. I chose to keep on and get more tests. After rigorous testing, it was determined that baby was healthy and I had screened positive due to the extra blood from the hemorraging. At 23 weeks (1 week before viability here), the baby had stopped growing. At this point I was at the high risk clinic about once a week so we listened to the heart beat and booked yet another ultrasound for the baby. If he still wasn’t growing, we’d need to get him out of there and into the NICU. Thankfully, he put on an oz between visits. Then, as if this wasn’t enough fun, I developed gestational diabetes at 30 weeks. I was expecting this as I had it with my previous pregnancies but it showed up late this time. This meant a huge diet change, multiple blood tests a day and 4 shots of insulin into my abdomen a day. My doses kept changing because the way the baby was reacting to the sugars and insulin. Because of how high risk I was, the doctors encouraged labor as much as possible. I endured 3 painful membrane sweeps, ate ridiculous food and tried every old wives tale. Nothing worked and the little guy stayed where he was. Turns out he was transverse (so across my belly instead of head down). I then, very hugely pregnant in the middle of August with no a/c, had to do all sorts of crazy yoga poses etc to get baby head down. I wasn’t allowed to go past my due date and my OB booked an induction for the day of. I could be called in anywhere from 6 am to 10 pm but if not by noon, it probably wouldn’t be happening. I of course couldn’t sleep so was wide awake by 6. No call. Took my big kid to school for 9. No call. Finally had early dinner at 4, with still no call. At 5:30 I was rushing to the hospital with bad cramps and broken waters. Around 5 hours later I had my boy. He was healthy but with low blood sugars so the NICU was still an option. Finally they let me go home after two nights and then it was me and a newborn and my big kid. I was supposed to take things “easy” after child birth. Yeah right. Landed myself back in with the Dr because I was hemorrhaging from too much strenuous activity (aka taking care of the household). Finally, everything got sorted and I thought life was back on track. Fast forward to February. Baby H was now 5 months old and the rest of us had adjusted to the new addition fairly well. Around the 21st I had a stomach ache but attributed it to the crappy dinner we had eaten to celebrate a birthday. But it didn’t go away all night. By morning I was fine but anytime I ate, it hurt within an hour again. So I thought I had a stomach flu, which was going around anyways. By the 24th I called the Dr because maybe I had something viral? It was a yucky stomach bug but I didn’t think much of it. Saw the Dr on the 26, she palpates my stomach but I had no pain response etc so she prescribed me pills for acid reflux but ran some blood tests just in case. February 28 I got a call before the Dr office even opened telling me I needed to go to the emergency room. In the emergency room they told me my pancreas had shut down, my liver was almost pooched and my gallbladder was definitely shot. I had several blood tests, ultrasounds, an MRI etc. Turns out I had a gallstone stuck in my common bile duct. I should have been in excruciating pain but I have a high pain tolerance (which the Drs have said before). The other patients with the same problems were taking morphine. I only took anti nauseants because I wasn’t allowed food for 6 days. On the 5th day I had an endoscopy where they stuck a camera and tube down my throat, through my stomach and cut a hole in my bile duct to push the stone into my intestines so I could pass it that way. Well the stupid stone got stuck on the camera and I have it to this day (it has been named Herman by one of the nurses). I immediately felt better and my toxic blood levels dropped significantly . On day 6, I had 4 incisions made into my abdomen and they pulled out my gallbladder and repaired a hernia that I had no idea was there. It was around a 5 hour surgery. Finally, I was allowed to go home and have my kids again!! This emergency room visit that my Dr had said would take a couple hours had turned into the hardest week of my life. The Drs then dropped the bombshell on me that I couldn’t lift 10+ lbs for a month or I could pop the hernia right back out or rip my stitches. They expected me to somehow be a mum and basically not move. My mother showed up twice a day to move the baby from the bedroom to the living room and back. I could barely nurse since I was able to lift him (or be on my sides). I lasted two weeks before I started lifting him (which out of 4 wasn’t too bad for stubborn old me). My most recent medical adventure (besides of course the regular sort of flus, colds, childhood illnesses and mastitis) has been a breast cancer scare. So far the results have been negative (ultrasound, antibiotics etc) but we also have no answers. Sorry for the long explanation, the point is: if the shtf, I probably wouldn’t have survived most of this. I have medical training but I certainly not a doctor. Even my surgeons were stumped, I had a 4mm stone blocking my duct and I felt fine. I was literally dying and had no clue. After my gallbladder went through pathology, was told there had been a 9cm stone in there as well. So think like a grapefruit or just shy of a softball. My gallbladder could have easily ruptured. How do we prepare for this? I might have been able to (poorly) perform the surgery on someone else but there’s no way I would have a diagnosis without blood tests and imaging. My best answer I suppose is to make sure yourself or someone in your group is medically trained in some form and to keep everyone at peak health through diet, exercise, proper sleep and regular doctor visits. Sorry everyone! I’ve had one heck of a year and a half. I had a very high risk pregnancy with several complications. Luckily, I welcomed a healthy baby boy late in September. Just as I was getting back into the swing of things, I had two emergency surgeries in March. Now, I’m finally able to have ten minutes to post now and then. Let me know what you’d like to learn about! It’s my birthday today and that means I got survival stuff as gifts. I’ll be reviewing each of the products as I get to play with them and I’ll let you know what I think. The day is still young, but thus far I’ve received a LifeSaver jerry can water filter system and a Black Widow folding slingshot by Barnett Slingshots. I’m really excited about both. So, that’s it for today, coming up I’ll have a couple recipes for food storage and of course these reviews. Take it easy and keep preppin! Tis the season for gardening and any prepper can tell you that the more food you can grow on your own, the better. I have a huge clump of chives in my back yard. They come back every year and spread from their roots so I had no idea they had seeds or that I could harvest the seeds to share. 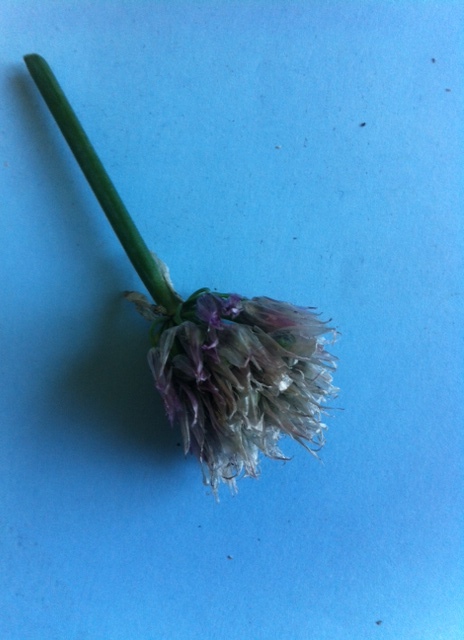 To start, you need to find a clump of chives that has flowered. 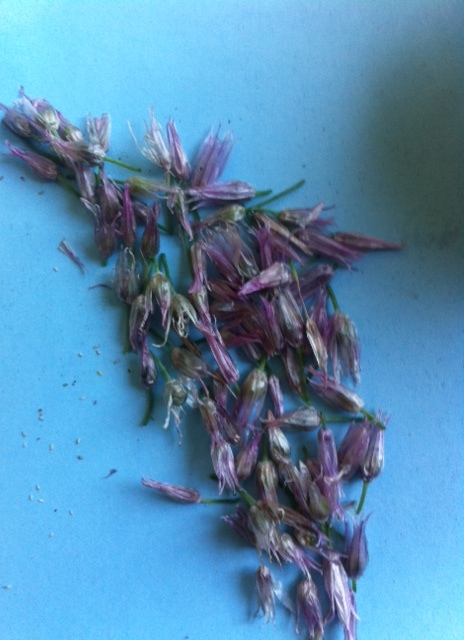 Select flowers that have mostly dried out. The tips of the flowers should be white and thin like tissue paper. The next thing I do is separate the flower blooms from the stem, to make them easier to sort. The dry flowers I set aside for processing and the not so dry flowers I either let air dry for a few days or compost if they are not even close to being ready. When you pull apart the flower, inside you will find a dark green to black ball, this is where you will find the seeds. Cut this apart, it should divide into three parts, leaving you with some sacks covered in a thin green film. 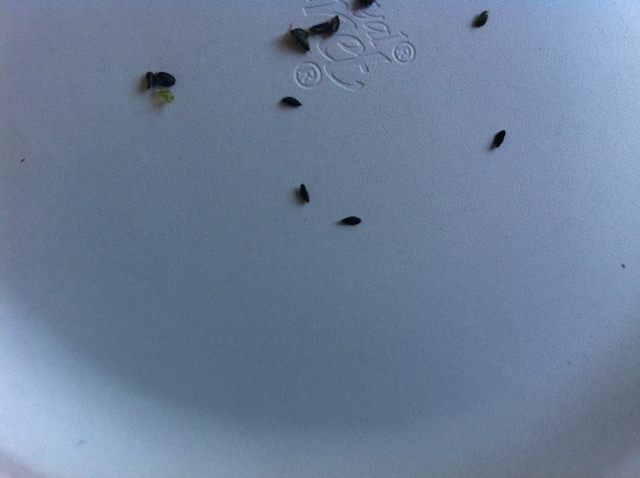 In each of these sacks is two chive seeds, gently remove the green film to reveal two small black seeds. Set the seeds aside to dry (I put mine on a paper plate away from any breeze) and then store. Chive seeds can be finicky and may only last a year even under optimal storage, so be sure to share with your friends. I believe it was Albert Einstein who said that without bees, the human species would go extinct within four years. Honeybees are so essential to our entire food supply and they’re dying off in scary numbers. Between colony collapse and sheer lack of food, our honeybees are disappearing. In my city, we can’t own bees without a whole lot of paper work and fees and inspections etc, etc, so I decided to dedicate part of my garden to bee friendly plants. Since I live in Canada, I can be somewhat limited to what plants will live here. This year the weather has been especially all over the place (to the point where several people I know had their furnaces on last night, almost a full week into June) and I’ve only seen two honeybees in my yard. But here’s a quick list of what I’ve planted that my local bees seem to love. Lavender – I have several lavender plants that I use for my soap business but even when I harvest, I leave several stalks that are constantly visited by our bees. Bee balm – (monarda) produces amazing spiky flowers and is always surrounded by bees. Strawberries – although I don’t grow these specifically for the bees, the flowers bloom fairly early and give the bees something to pollinate before the other plants show up. 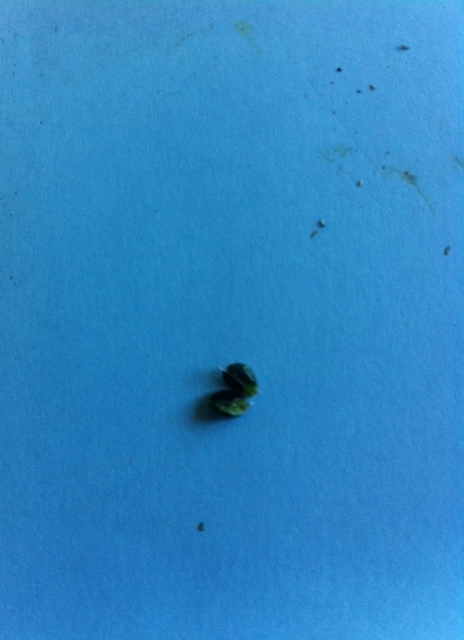 Clover – I have a small piece of the property that isn’t maintained and it is crawling with clover. Anytime I pull up clover from any other part of the lawn, I throw it there to help seed it. I’m sure we’ve all heard of clover honey? Lilac – although this plant belongs to one of the neighbors and not me, I stay away from it because its surrounded by bees while in bloom. Most of these plants are fairly hardy regardless of where you are in North America, so consider placing some of them on your land. We all need bees. Please try to avoid commercial insecticides as well and try a natural alternative such as companion planting, soapy water or manual pest removal. This is one of the most popular questions I get. How to make money from home so you can homestead or prep more or just feel safer in general. There are several ways, some of which I use myself, some that make minimal money and some that can make exponentially more. Let’s get started. -Start a home business. I personally own a soap business (www.alchemysoapworks.com). In this day in age, just about anyone can start an online business from selling products like I do, to providing consulting, making websites or writing. -Sell on ebay, etsy or craigslist. Many people have things laying around that they no longer need but don’t necessarily want to get rid of. Why not make a little bit of extra money for your clutter? I have a friend that sells her children’s outgrown clothes by the bag online and she makes a killing. -Maintenance. mow lawns, shovel snow, paint houses, whatever you can. This may seem juvenile but you can really make quite a bit of money helping out elderly neighbors or people with young kids that don’t have the time themselves. -Pet sitting. Like animals? You can offer your services as a pet sitter on websites such as craigslist but it will look much more professional to design a website. Put up signs in pet stores, at your vet and in grocery stores in your area. -Online surveys. This is something I’ve been doing for years. You do have to be careful as some survey companies are pretty shifty but once you find the good ones, stick with them and build up your points. Most survey companies pay out via cheque or PayPal. I generally make a couple hundred dollars a year and cash out around the winter holidays. Not much, I know, but if you’re online anyways, its not a bad way to kill some time. Have something that works for you? Be sure to share it in the comments!